When Is A House Plant Not Dead? I’m sure just about all of you would have disposed of this plant long ago. It’s a myrtle–one of my favorites. It is such a favorite that I spent a decent part of one quarter of the Super Bowl picking most of the dead leaves off. One thing I hate to do is to look at dead leaves. Prior to that denuding, it looked like this. Actually it looked much worse than that because it had a lot more leaves. This is a natal plum. It’s just recently decided to do the “shrivel up and dry out” thing. 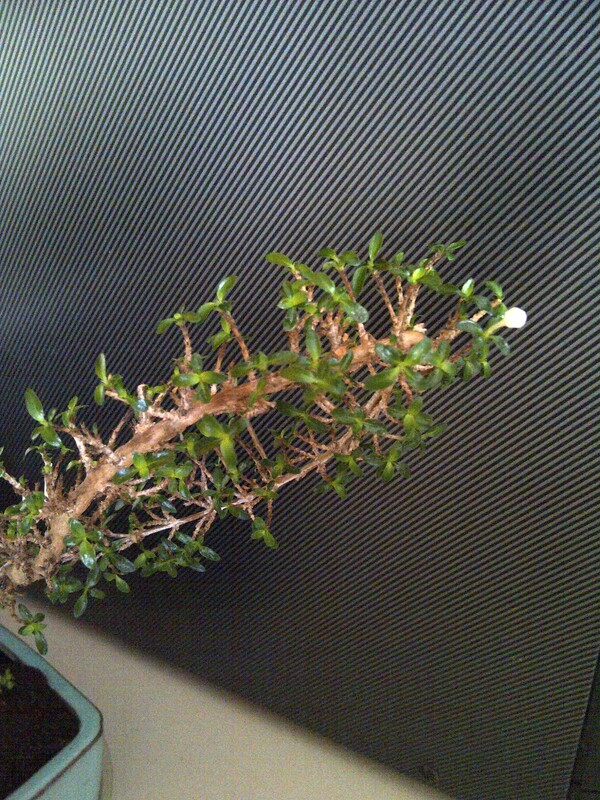 Prior to that, my serissa, or snow rose, had done the same thing, except it did it more slowly. 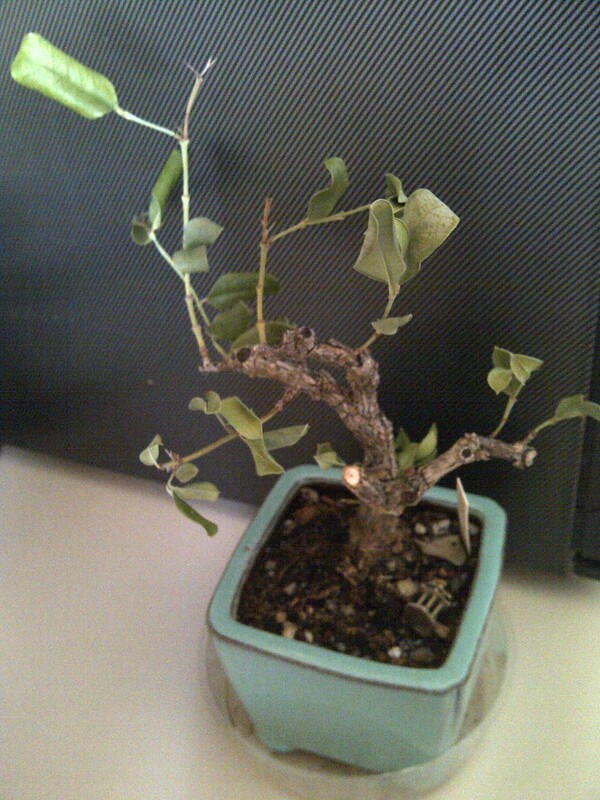 All through November and December, it lost its leaves in messy and discouraging fashion until it was completely bald. This is what it looks like now. You can see in the upper right hand corner of the photo, that white spot sticking out? That’s a bud. So these “dead” plants really do resurrect themselves. I’m not sure why it happens. In my examples, all of my plants are bonsai. But that’s not they only type of plant that this happens to. Ficus are notoriously finicky, particularly the weeping fig and the creeping fig. Every time I turn around my creping fig is dropping its leaves. Miniature roses are another one–they seem to want to molt on a regular basis when kept indoors. And of course bougainvillea are prone to do this as well. So a word of caution to the newer plant enthusiast? 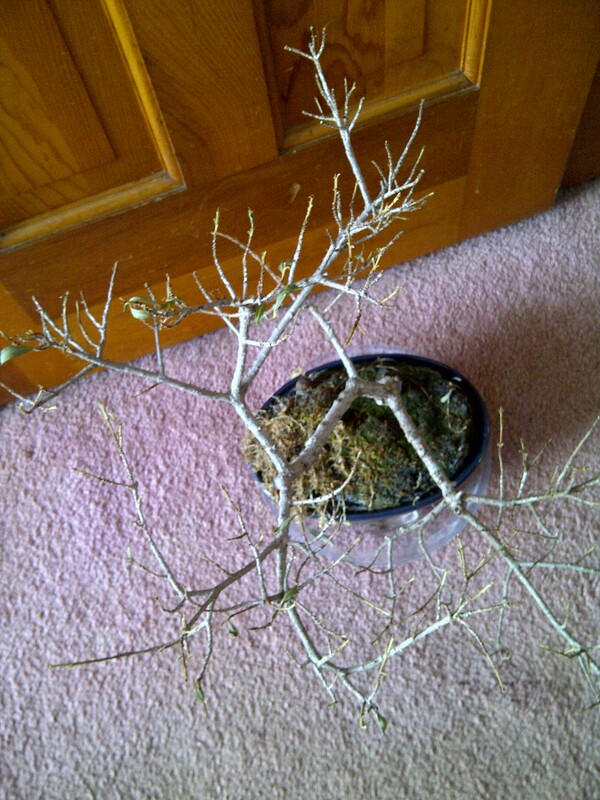 Sometimes a plant that loses all its leaves really isn’t dead. Sometimes it’s just taking a well deserved nap! my bunches of blooms plant did the same thing it lost its leaves when I brought indoors too but it started to grow new leaves, my guess it was adapting to the different conditions of higher filtered light now it is blooming. sometimes it is shock or sometimes it is a renewal of the leaves I guess the leaves get old and worn out too. I think you are exactly right, Roberta. Just as we transition plants out in the spring so they don’t sun burn, in the fall, it’s the opposite. They come indoors and think, “hey! Who turned off the sun?” Even if we have a full sun south window, it’s still not nearly as bright as being outdoors. And leaves and even plants do have a natural life, just as we all do. It’s what they mean when they say a perennial is ” short lived,” for example.